Plan a day trip to explore rural Montgomery County using Heritage Montgomery’s driving tour of the Agricultural Reserve as the perfect guide. 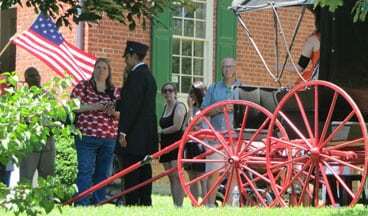 The 60-minute video, the Montgomery Rural Heritage Byway Tour, is divided into five chapters, each showcasing a section of rural Montgomery County. Stories are presented through narrative, visual materials (photos, drawings, and written materials of the period) and music. The 61-mile scenic tour takes you along many of the county’s rural and rustic roads and along the C&O Canal. Activities relating to the Civil War figure prominently in many chapters. Historic images, coupled with contemporary shots, allow you to stand in the landscape today and imagine life long ago from the same vantage point. You can purchase a copy of the video from the HM gift shop to watch on your DVD player and take an armchair tour! To read the Ag Reserve Driving Tour brochure, click here. Visit the Sugarloaf Regional Trails website for themed walking, biking, driving, and canoeing tours throughout the region.